Congratulations to one of Mike's students Wes Medley, who hit one of the longest home runs ever seen at St. Albans High School Field. He hit it over the scoreboard in left center into the back of the day care center across the street, over 400 feet. It was a walk off 2 run home run. In the double header he had 7 hits in 7 at bats. This from a 5 foot 9 inch 140 lb Sophomore hitter because he is learning to swing like the elite hitters in Major League Baseball. To Mike, The Best Hitting Coach Ever!! "I LOVE THIS SWING"
Our first lesson with Mike we immediately learned what was actually a great baseball swing. Mike put Joel's swing on video next to the best hitters like Mike Trout, Ken Griffey Jr. etc. (I highly recommend this). Frame by frame he showed us how the best actually swing the bat and where we could improve, it was the opposite of what he was doing (before top photo). Joel had so many bad habits to unlearn and like almost everyone he was still being told to stay back, squish the bug, twist the hips, fast hands, hands to ball, all the things the very best hitters don't do. It was tough to change but thankfully we kept working on it. By Joel's freshman year (last year) much of what Mike had shown him was sinking in and he ended the year hitting .357 with a .614 on base percentage. Mike, you are a miracle worker. What you have done for Cooper's hitting is nothing short of amazing. We were being taught most of the wrong hitting cues from your list for 8 years. Your swing has made him an amazingly better hitter. Last year his batting average was .115 and this year he hit .423 all because of your swing. His high school coach can't believe the difference in his power and consistency. He is now leading the team in hitting. You have a real gift for teaching. Thanks, Travis B. The swing you teach is head and shoulders better than anything being taught, anywhere. It helped my son, who was rarely hitting the ball out of the infield, become the most powerful hitter in St. Albans Little League history hitting a record 22 home runs and batting over .750 while weighing only 90 lbs. Almost every baseball and fastpitch softball hitter that comes in for lessons says they see the ball well and are hitting the ball but don't have as much power or consistency that they think they should have. Sadly, the reason for this is 99% of baseball and softball batters are being taught the wrong (worst) hitting cues (listed below) by their coaches, hitting instructors, former High School, College and Pro players, at college and pro hitting camps, by other parents and from instructional books. Worse, almost all middle school, high school, college and professional coaches either teach the worst hitting cues below or send their players to instructors that do teach them. These hitting cues are the reason hitting at all 4 of these levels have gotten so much worse every year. They are the reason Major League hitting has gone down so drastically the last 14 years. In 2006 the average MLB player hit .269 and had a strikeout percent of 16.8%. In 2018 the average MLB player had a batting average of only .248 which is the lowest since 1972 and a strikeout percentage of 22.3%. Also last year is the first year in MLB history that there were more strikeouts in a season than hits. This year as of April 21 the average MLB hitter is hitting only .245 which is the sixth worst batting average since 1900 and has the highest strikeout percent in the history of baseball since 1871 at 23.4%. Hitting keeps going down only because 99% of players are being taught the worst hitting cues below. These are the WORST hitting cues being taught in both baseball and softball. Because 99% of baseball hitters are being taught the worst hitting cues from above this is what all of our new students look like at impact. They are late, inconsistent and little power. This should not be happening! This is one of my students that looks the opposite of 99% of hitters at impact because he is learning how to correctly swing like the very best hitters. He only weighs 140 pounds and has become one of the most powerful and consistent hitters in the state. These swings show what elite hitters look like at impact. They look the opposite of 99% of hitters in baseball because they are doing none of the bad hitting cues above. This is why elite batters hit the ball so much more consistently and with more power, year after year, than the average hitter. It's the same in softball. Here are two before and an after photo of one of my students. The first two pictures show what she looked like before our lessons and what 99% of our new softball students look like at impact (late, inconsistent and little power) because they have been learning the worst hitting cues from above. The third picture shows what she looks like at impact now after learning how to swing like the the very best hitters in softball. Amazing difference in her timing, power and hitting line drives much more consistently. This is what elite hitters in softball look like at impact. They also look the opposite of 99% of hitters in softball. They are doing none of the bad hitting cues above. This is another one of my students that learned how to swing like the very best hitters. So powerful at impact. This is a triple off the fence. When the very best Major League baseball and Team USA fastpitch softball players are hitting their best they are doing NONE of the above bad hitting cues. Any of these cues will put even the greatest batters into slumps giving them much less power, consistency and bad timing. For the average batter these hitting cues are much more devastating. To be the best hitter, you need to swing like the very best hitters in Major League Baseball and Team USA Fastpitch Softball. 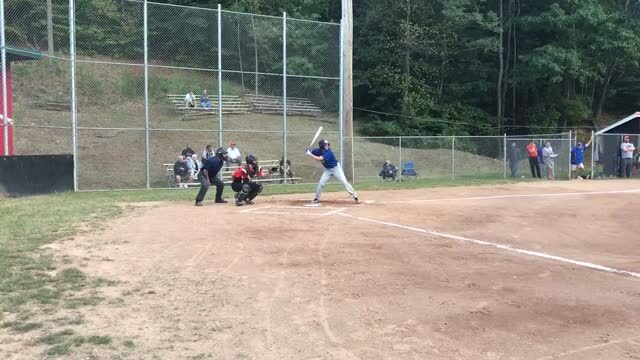 This video is one of my students in a travel league game that is learning to hit like the best. This is a line drive that was hit so hard it kept climbing and went over the fence for a home run, even clearing two warehouses across the street. You can hear people in the background amazed how hard and far it was hit. Three years ago he couldn't hit the ball out of the infield because he was being told to swing down, swing faster, twist the hips and stay back by the High School coach. He now knows when he does any of those bad hitting cues he will hit his worst. Now as a 130lb Freshman he is the best hitter on his High School team because he is swinging correctly with his body, not his arms. If you really want to become a better hitter, with much more power and a higher batting average, you want to learn the exact hitting mechanics of the best hitters in Major League baseball and Team USA fastpitch softball. You no longer have to be one of the 99% of players that are learning the bad hitting cues above and going to bad lessons where the instructor just throws pitches and tells the student good swing, now swing faster. At Mike Sedberry's Hitting and Pitching Academy you will learn the exact hitting mechanics of the very best hitters in baseball and fastpitch softball. You will learn them step by step so you can become a more powerful and consistent hitter. The results for our students have been amazing. Almost every parent tells me when they swing the way they are learning now, their son or daughter's hitting is head and shoulders above the other batters. When they revert back to their old swing using fast hands, twist the hips, stay back, swing down, etc., they go back to being just an average hitter. The difference between the two swings, it is like night and day. I video every new baseball and fastpitch softball student that comes in for lessons so they can see frame by frame what they are doing in their swing. I then show them how their swing compares with the very best professional hitters. Students and parents are amazed that their swing looks the complete opposite of the very best hitters because of everything they have been taught. They also see they will now start learning the exact hitting mechanics of the very best. Don't settle for anything less! Baseball players swings are compared with the elite MLB hitters like Mike Trout, Miguel Cabrera, Joey Votto, Ken Griffey Jr. and others. Students and parents get to see the very best hitters all swing virtually the same way. You will learn step by step the exact way they swing the bat. Fastpitch Softball players swings are compared with the elite Team USA hitters like Jennie Finch, Andrea Duran, Natasha Watley, Jenny Topping and others. Students and parents get to see they too all swing virtually the same way. You will learn step by step the exact way they swing the bat. The video is very important because you get to see that elite hitters all swing the same. Sadly, most hitters don't reach their full potential because what they are learning makes them swing the OPPOSITE of the best hitters. When you work on the correct hitting cues it is amazing how quickly you will see an increase in your power, consistently hitting more line drives and improve your timing. Give us a call and start learning now how to hit with much more power and a higher average because you are swinging correctly with your body, not your arms. If you want to do hitting and pitching together we suggest a 1 1/2 hour video for the first lesson. We will video you hitting and pitching and compare you to the best, the same as above for both. Then future lessons we can work on both during a 1 hour lesson. We have students and parents that drive 3 hours or more from all over West Virginia, Ohio , Kentucky and Virginia for lessons. Most come in and take lessons over a two day period. We have special rates at a local hotel. They come to us because they are learning the same bad hitting and pitching cues in their area and their kids aren't reaching their full potential. They are excited to see their kids swing or pitch compared to a Major League or Team USA player. They are amazed that it is so different from what they have been learning. When they see how much better they get in just two days of lessons they are blown away. Call 304-722-6393 for more information. Teams and Groups of 2 or more students call for special pricing. Call today 304-722-6393 for more information or to schedule your lesson. You will be amazed with the results. Learn the best way to hit with the BBCOR bats. Almost all hitters stats are way down, especially the power numbers (home runs down 35 to 40%) because most hitters still swing mainly with their arms. My students hit the ball hard with the BBCOR bats because they swing with their body. Don't let the BBCOR bats make a negative impact on your hitting. Call us at 304-722-6393 and learn the correct way to swing the bat. Make your career even more successful.